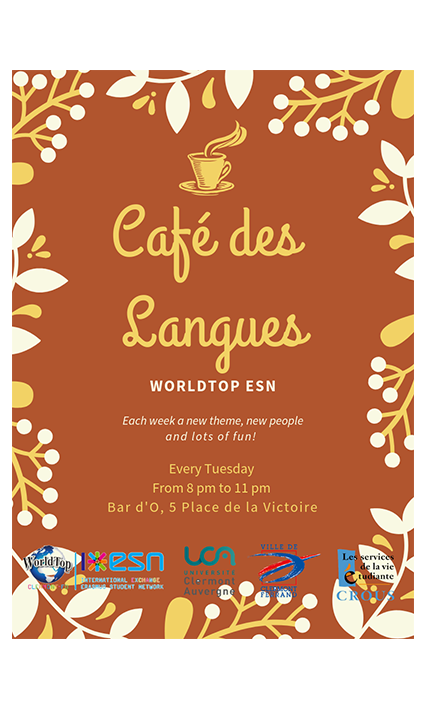 The Café des Langues with WorldTop ESN is THE event! Every Tuesday evening, the WorldTop team waits for you at the Bar d'Ô, 5 place de la Victoire, from 8pm to offer you a festive and convivial moment. Each Café des Langues has a specific theme with its games, activities and quizzes... This is the place to be if you want to meet new international students and discover new cultures while having a drink of course! We hope to meet you at one of our events. Come and meet us on Tuesday 8th!